Vulnerable Wherever They Go: Death of "Piper"
Hauling the carcass to transport to the necropsy location. Photo: Jean-Francois Blouin, Canadian Whale Institute. 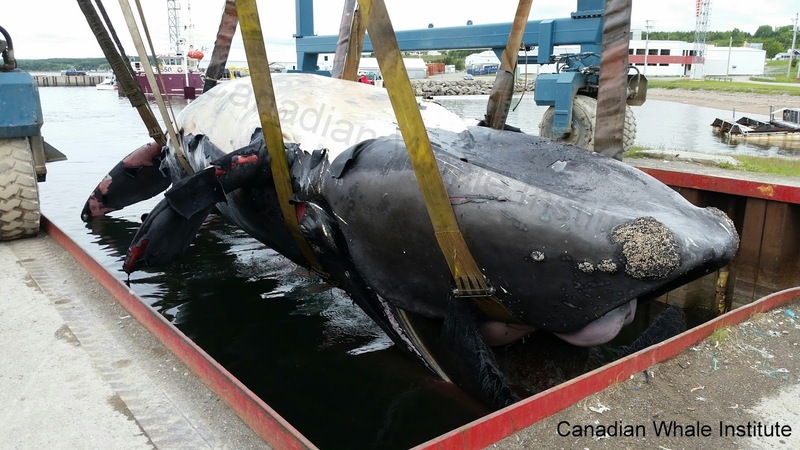 As I type, a long known whale friend of ours is being hauled out of the water on a boat lift in Newport, Quebec on the south side of the Gaspé Peninsula. Two days ago, colleagues of ours at GREMM reported a dead right whale floating off Percé, QC in the Gulf of St. Lawrence, Canada. Right whales are seen sporadically in the Gulf of St. Lawrence and there has been increasing evidence that they may use the area more than previously thought. But this is only the second carcass to be found there in the past 35 years. Knowing the importance of this death, a number of agencies and organizations in the region responded to the urgent call for action to develop a plan of how to get the carcass to shore and where to take the whale to do a necropsy. These scars helped us identify who this whale was. Back in Boston, our team flew into action trying to identify the individual. Always a disheartening task, this was also a challenging one as the whale was floating upside down and all the usual identifying features were under water. With only three photos to work with, our match was slow to come until mariners posted additional photographs taken from a different angle, showing some scars on the underside of the body in place where the beautiful black skin had not yet peeled off. There was a flurry of emails back and forth as three of our team members came to the same conclusion at the same time. This unidentified carcass suddenly became an old friend- Piper, Catalog #2320. Piper and her 2009 calf. Photo: Jessica Taylor, New England Aquarium. NOAA Permit 655-1652-01. With only about 500 whales left, the loss of any right whale is heart breaking. But Piper…. We had been observing her since 1993. We watched her participate in many courtship groups, we saw her entangled in fishing gear two different times- both of which she eventually shed on her own. We watched her grow and mature, giving birth to three calves- the last one just two years ago. We saw her every year and in all of the major right whale habitats; so consistently in fact that we made her one of our right whale sponsorship whales- a selection of some of our favorite whales that kids and adults alike can sponsor and get to know (tragically, we recently lost another of our sponsored right whales, Snowball). Piper in 2013. Photo: Florida Fish & Wildlife Conservation Commission, NOAA Permit #15488. We have to wait to see if the cause of death can be determined- there were no obvious external signs. Could this have been prevented?? That may be concluded from the necropsy. For now, we grieve for a good mother and an old friend. i hope she ahd a fast and "natural death" thanks for ur work..the personal quasi involvement with the whaelfriends and a little bit of anthromorphisacion seems to be the way out of extinction desaster...may we all swimmtogether one day in whale heaven..